The city bus line 6 runs from Pile Gate (western entrance to the Old Town) via Boninovo, Vukovarska street, Batala, Lapad bay towards Babin Kuk. This bus line is convenient for tourists staying in Babin Kuk area to reach the Old Town. The last bus stop on this line is situated only a few steps from Valamar Collection Dubrovnik President Hotel, Hotel Neptun, Hotel Ariston, Royal Palm Hotel and Royal Princess Hotel. The bus line 6 runs from early morning to late evening, every 10 minutes. Check out below bus stops on this route. Check the latest timetable of bus no.6 here. 1. STOP: Pile Gate: Departure point of most city buses is Pile Gate stop. This stop is just outside the Old city walls (on the west side). 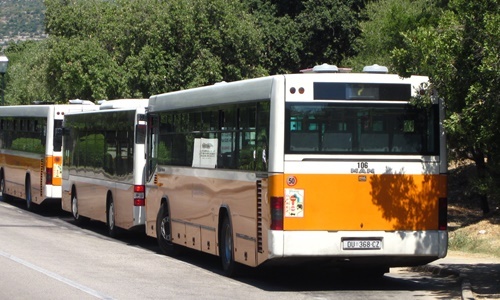 From there you can easily reach other areas of Dubrovnik by bus or by taxi. Shuttle bus from the airport also stops here on its way to the main bus station in Gruz area. 5. STOP: Vukovarska street: This stop is located close to the commercial centre of Dubrovnik where you can find banks, post office, large grocery stores 'Tommy' and 'Pemo', shopping centre 'Mercante', newspaper shops, cafe bars etc. Department store 'Minceta' is located nearby. In this department store you will find several clothing stores, cosmetic stores, hairdresser and cafe bar with an outdoor terrace. 8. STOP: Hotel Lapad: Get off the bus at this stop to reach either Hotel Lapad or Hotel Kazbek. 10. STOP: Post office Lapad: Get off the bus at this stop to reach Lapad bay hotels (Hotel Zagreb, Hotel Dubrovnik, Hotel Perla, Hotel Sumratin, Grand Hotel Park and Hotel Kompas) and beaches. In this area you will find a great choice of private accommodation facilities (rooms, hostels, apartments). 13. STOP: Babin Kuk III: Get off the bus at this stop to reach following hotels: Hotel Valamar Lacroma, Hotel Valamar Club and Tirena Sunny Hotel. 14. 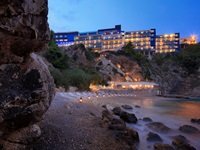 STOP: Hotel Dubrovnik President: Get of the bus at this stop to reach Valamar Collection Dubrovnik President Hotel, Hotel Argosy, Hotel Ariston, Hotel Neptun, Royal Princess Hotel and Royal Palm Hotel. All these hotels are located 5 minutes walk from the bus stop. From this stop you can easily reach Babin Kuk promenade where you will find many nice restaurants, bars, souvenir shops etc. If you take a gravel path leading toward the sea you will reach Copacabana beach and Cava beach. 1. STOP: Hotel Dubrovnik President: This bus stop is located just across Valamar Collection Dubrovnik President Hotel and within walking distance from other hotels (Hotel Argosy, Hotel Ariston, Hotel Neptun, Royal Palm Hotel and Royal Princess Hotel). 2. STOP: Babin Kuk I: This bus stop is located within walking distance from Hotel Valamar Lacroma, Hotel Valamar Club and Tirena Sunny Hotel. 4. 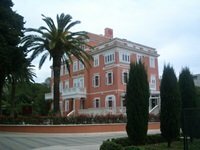 STOP: Post office Lapad: This bus stop is located close to Lapad bay promenade where you can find following hotels: Hotel Zagreb, Hotel Dubrovnik, Hotel Perla, Hotel Sumratin, Grand Hotel Park and Hotel Kompas. In this area you can find numerous private accommodation facilities. 5. STOP: Traffic lights Lapad: This bus stop is located close to traffic lights Lapad. Hotel Ivka is located nearby. 7. STOP: Traffic lights Gruz: This bus stop is located close to commercial centre of Dubrovnik. In this area you can find several shops, cafe bars, banks, department stores, grocery stores, post office etc. 8. STOP: Dubrovnik Court: This stop is just outside the Dubrovnik Court. From here you can easily walk to the commercial centre of Dubrovnik. 9. STOP: Pera Cingrije street: This stop is located within walking distance from 'Bourbon street' where many cafe bars are located. 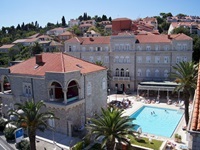 Both Hotel Bellevue and Hotel Rixos Libertas are located nearby. 11. STOP: Pile: The Pile Gate is located just outside the Old Town and close to Hotel Hilton Imperial.